Alongside valuable CV advice, templates and practical tips, You re Hired! How to write a brilliant CV now includes a new extended chapter, revealing how to use LinkedIn, Twitter, Facebook and other social channels to find jobs, research companies and maintain a professional web presence. Authored by Corinne Mills, founder of the UK s leading career management and outplacement company, Personal Career Management, this book provides valuable insight into what recruiters and employers are looking for. Corinne is considered to be the UK s leading authority on CVs and the job search process and regularly features as the career expert for the Guardian, Telegraph, FT, Monster as well as the BBC. You re Hired! How to write a brilliant CV is essential reading for creating the best possible CV for the job you want, whether you re just starting out or moving your career forward. This book guides you through the preparation process to identify your most relevant skills and experiences for the position you are applying for. 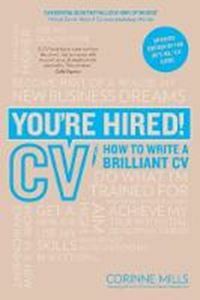 Filled with real-life examples and practical advice on how to address tricky career challenges, and use your CV to stand out from the competition, this is an indispensable guide for job hunters. The You re Hired! series from Trotman guides job hunters through the challenging process of finding and securing their perfect role. Each book is written by an expert in their field and is filled with tips, advice and useful exercises to help prepare for every stage of the job search.